As my mother can attest, I am a fan of baked chicken. So after accruing 29 years worth of baked chickens, one starts to wonder at that kind of variety you might be able to get in how ones goes about baking a chicken. I ran across this recipe, which sounded particularly interesting for its use of leeks and sage as well as its coating of the chicken in balsamic vinegar (amongst other things). Preheat oven to 400 F. Place chicken, vinegar, oil, chopped sage, rosemary, and garlic in large bowl; turn chicken several times to coat. Arrange leeks and sage sprigs in bottom of metal baking pan. Place chicken with herb and vinegar mixture atop leeks. Sprinkle chicken with salt and pepper. Pour broth around chicken. Roast until juices run clear when thigh is pierced, about 45 minutes. Place chicken and leeks on platter. A few notes on preparation: Our chicken was 3 lbs. We unfortunately couldn’t get ahold of fresh sage, so we substituted dried sage (1 tbsp + 1 tsp) in the vinegar mixture. Because David was cooking, we doubled the number of garlic cloves. We also used only 4 leeks, as that was plenty to sit the chicken on. D also made a gravy from the pan drippings by adding a bit of cream and reducing it. A delightfully straightforward dish to make, yielding delicious dividends. The leeks infused the chicken with a lovely rich, round flavour. The balsamic vinegar coating gave the chicken a beautiful browned look. The balsamic, which is not something we typically cook with chicken, gave it a great mix of tanginess and sweetness. Perhaps the only odd part was the cooking time: it ended up taking over an hour (probably close to an 1 hour 10 minutes). D ended up turning the bird over in order to facilitate the cooking of the thighs and reduce drying of the breast. We suspect that lowering the temperature, perhaps to 350 F, and cooking it for longer might help to cook it more evenly (which is typically how we normally roast chicken). 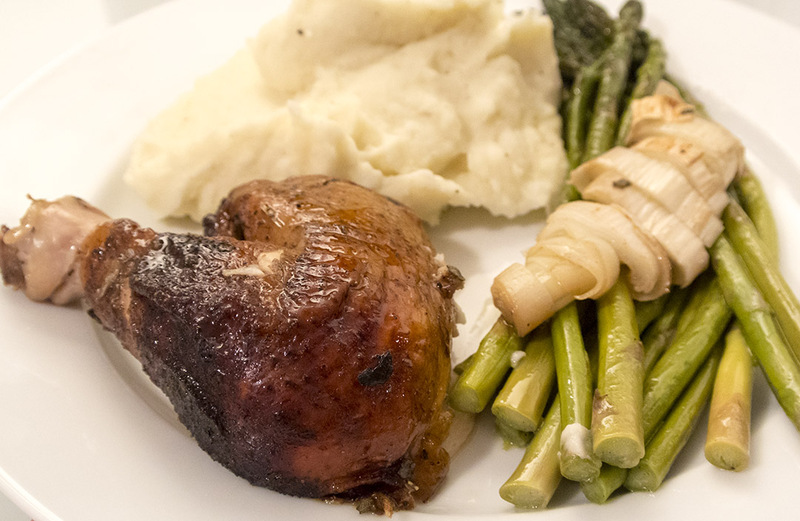 Other than that, the chicken, paired with some deliciously creamy mashed potatoes and some asparagus, was superb. We will definitely make this again!